The SE Series - BEMA, Inc. The SE SERIES enclosures provide an anti-eavesdropping capability to the user. When the RF enclosure is fully assembled, the user is able to operate several and varied pieces of electronic information handling equipment such as PC's, FAX's, Copiers, Laptop's, Teletype's, Scanners, OCR's, modems, inside the enclosure without the threat of compromising emanations from such equipment escaping to the outside where it can then be intercepted and read by surveillance gear. Each one of the above mentioned pieces of equipment emanate RF signals during operation. This means that whatever type of information that is stored, processed, transmitted, or manipulated within this equipment actually escapes into the air around itself in the form of RF signals which can be intercepted by an RF monitor. Electronic eavesdropping occurs routinely in the industrial, corporate, military, and government communities. The motive for this activity is nearly always to obtain proprietary information concerning national security issues, corporate trade secrets, marketing information, client/customer details, and any other valuable information that would give the perpetrator an advantage over the victim. The good news is the SE SERIES enclosures provide a large degree of protection against electronic eavesdropping in the form of a highly portable RF shielded room. EMPLOYMENT OF THE SE SERIES ENCLOSURES SHIELDS RF SIGNALS IN ORDER TO CONCEAL AND PROTECT PROPRIETARY INFORMATION. portable, the SE-3 saves time and money. Portable RF shielding security for laptops, PCs and all other types of office information equipment during operation within the corporate environment. Attenuates emanating signals from equipment thereby creating a "secure area" for executives and staff during normal business operations or during special high level meetings ie., (contract negotiations, product design and development, strategic planning, interviews, etc.). RF shielding of communication and information processing equipment during covert operations. Provides an "electronic-blind" for police and military personnel during sting or battlefield missions. Shielding for isolating sensitive industrial equipment from unwanted outside electrical interference. Use by RFI test teams to isolate equipment under test from ambient electronic emissions. (For example, Cellular telephone companies require testing of equipment in the field at or near cellular equipment hubs where there are large concentrations of RF signal noise. Use within health treatment facilities (hospitals and clinics) to isolate medical equipment with high susceptibility to RF interference from cell phones and other wireless communications devices. Reduces the risks involved with signal interference and critical monitoring equipment such as heart fibulators, monitors and more personal equipment such as pace makers. To protect health care workers, military personnel, industrial workers and the general public from high levels of electromagnetic radiation (RADHAZ) produced by different types of medical and or industrial equipment. Establishment of a temporary and highly portable communications center for government or isolating emissions from office equipment being used to generate data for critical industry negotiations. Establishment of permanent secure communications centers where severe floor loading restrictions exist such as in old buildings. Military Standard attenuation measurements for enclosure, electromagnetic shielding, for electronic test purposes, method of, dated 25 June 1954. National Security Agency specification for RF shielded enclosures for communication equipment, dated 30 October 1965. Washington, DC -- in today's world, corporate espionage has become a fact of business life. As important as research and development ideas are to a company, they are even more valuable to its competitor. As the annual conference of the American Society for Industrial Security (ASIS) held recently in Washington, D.C., Monsanto Company's booth included an informational display about a unique, portable solution to the problem of electronic surveillance. Made with Monsanto's Flectron metallized fabric, the lightweight, portable shielding enclosure is a development of BEMA, Inc. a Virginia company specializing in portable shielding enclosures. The patented SE-2 enclosure is effective against electric and plane wave fields. This fabric-based structure offers significant advantages over shielding structures presently in use which are expensive, difficult to assemble and disassemble, heavy and awkward to transport. In addition, currently available structures only provide 15 to 45 decibels of shielding in electric and plane wave fields. Testing has shown the model SE-2 enclosure to provide effective shielding (>55 decibels) from electric fields and plane waves, making it extremely effective at blocking electronic eavesdropping. Isolating equipment in shielded enclosures prevents unwanted interference or electronic communication between individual pieces of equipment and eliminates radiation of classified or covert information. Currently available shielded enclosures which are effective against electric, magnetic and plane wave fields are expensive, permanent structures made of bonded layers of metal. 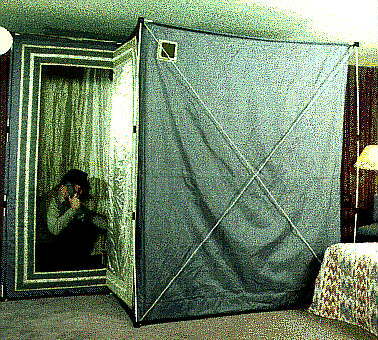 In addition, the lack of mobility and expense of such a shielded enclosure makes it impractical for use in active mobile military and covert environments. 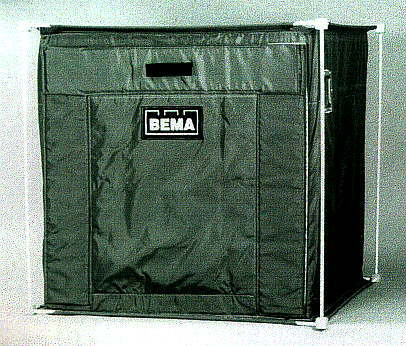 The BEMA SE-2 enclosure can be carried in two lightweight bags. With a combined weight of only 125 pounds, both bags are easily carried by one person. 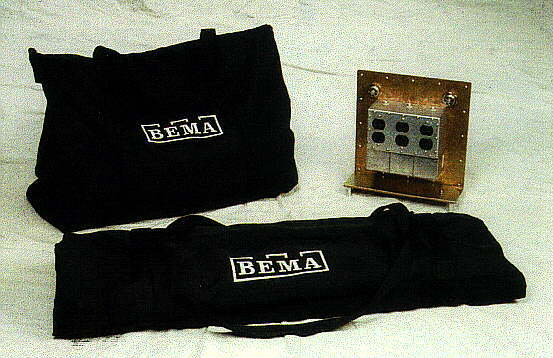 The BEMA-designed enclosure can also be assembled by one operator. The fully-assembled enclosure is 6 feet wide by 6 feet long by 7 feet high. Isolation testing of the enclosure was performed by Bendix Field Engineering Company of Columbia, Maryland, to MIL-STD-285 and NSA specification 65-6 methodology. Monsanto's Flectron metallized fabrics are made by depositing metal onto fabric substrates to provide the qualities of metal plus the unique performance characteristics of the fabrics involved. Copies of the complete test report as well as more information about the model SE-2 portable shielding enclosure can be obtained by writing to BEMA, Inc., P.O. Box 176, Dumfries, VA 22026-0176; or by calling (703) 719-8574. BEMA, Inc. of Dumfries, VA, believes is has come up with part of the solution to one of the most vexing problems found in the modern business environment, how do you protect proprietary information? BEMA is marketing a device (SE-2) that they claim can prevent electronic eavesdropping. Robert Thomas (president) states that the SE-2 is a product that has arrived at a time of great need. Thomas says, "I am confident that we'll see a sharp decline in total asset losses once solutions like the SE-2 are more widely employed." How great are the losses that Thomas is referring to? In assessing the need to prevent industrial espionage, and its economic impact, Richard Heffernan of R.J. Heffernan Associates (Branford, CT) stated that industry estimates have placed the drain to corporate coffers as being between $30 billion and $100 billion per year. There are some who would think that the problem may be over valued; however, some concrete research has been done in the area. Heffernan Associates did a survey at the behest of A.S.I.S. (American Society for Industrial Security) to get some idea of the extent of the problem. A nationwide sampling was picked consisting of 246 businesses. The results were 589 reported attempts of misappropriation targeting technology, trade secrets, or business plans. Only 32 (13%) companies put actual dollar amounts on the losses, and the losses for just those 32 amounted to $1.8 billion. If a mere 13% of the respondents suffered losses totalling nearly $2 billion, what then would the total have been for all the respondents? Further, with the sample size being as small as it was, what would the total be for all U.S. Businesses? It would seem that the estimates are very close to what the facts would be. The survey also found that the most valuable information was client lists. The estimates vary so greatly for many reasons. According to a spokesperson for the FBI, the main reason that it is so difficult to come up with a concrete figure is that most companies are loathe to admit they have been victimized. This factor is compounded when you realize that some types of information do not readily lend themselves to the placement of a dollar amount. What is your bid for that contract worth? How much is the research you've done towards a new product or enhancement to an existing one worth? What happens when stock prices spiral downward because a big contract award goes to your competitor, or the competition releases the latest and greatest before you can? The best case scenario for any of these events is economic ruin! Companies goes to great lengths in an attempt to circumvent this type of scenario. They will shred documents of a sensitive nature. All data transmissions will be encrypted. Specially bonded couriers will be used. Companies will have their board and conference rooms electronically "cleaned." These types of preventative measures work fine in your own environment, but how many executives do business only in their boardrooms? How many deals have been discussed or closed on airliners, in lounges, or in hotel rooms? What do you do when you need both secrecy and portability? The need for portability is evidenced by the fact that businesses have to worry about not only their competition committing these acts, but foreign governments as well. The January 27th Intelligence Newsletter (Indigo Pub - Paris, FR) contains an article that states foreign intelligence agencies are actively debating whether they should report intercepted economic information to businesses within their nation. Specifically, the article names the German Bundersnachrichtendienst (BND) as seriously considering involving themselves in this type of activity. The article also cites a case where the U.S. National Security Agency (NSA) intercepted a conversation between the heads of two European corporations. The information gathered from the call was then forwarded to the companies' American competitor. There are reports of foreign nations training flight attendants on how to spot the right executive to observe during flights. There are reports of nations putting out technological "hit lists" of desired information, and how may hotels have intelligence agency personnel working there in one capacity or another? It was solving the problems these scenarios encompassed that prompted the formation of BEMA (Bulwark Electromagnetic Material Applications). Thomas states that the company was incorporated in 1991, and it employs himself, Ned Paes (vice president - operations), Joseph Aldridge (vice president - product development), Robert Keller (controller), Harry Hinz (corporate secretary, counsel) Donald Lachman and Arthur Sills (testing and design engineers). BEMA's product is manufactured in Pennsylvania. The personnel that make up BEMA's base all have substantial background in government services and are heavily recruited from technical backgrounds. Their past experience comes from such notable areas as the Department of State, Naval Research Laboratories, and the National Security Agency. The end result of BEMA's research into solving the problem of information security with portability is the SE-2. 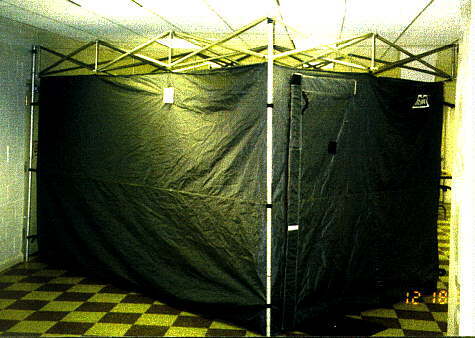 The SE-2 is a 6 x 6 x 7 foot portable enclosure made from Monsanto's Flectron metallized material. The unit comes in two storage bags that together weigh 125 pounds, and can be assembled by one person in less than 25 minutes. Thomas states that the enclosure will prevent electronic eavesdropping of conversations or transmissions emanating from communicating or computer (PC's) equipment. 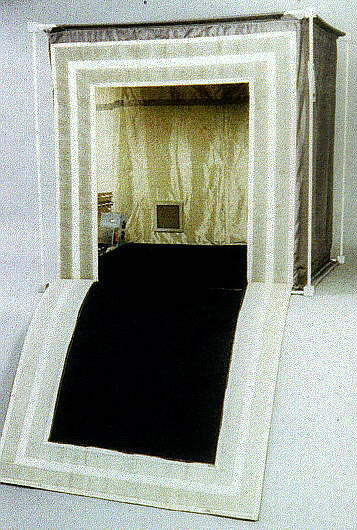 Attached to the main room of the SE-2 is a vestibule that allows the operator to exit without compromising shielding effectiveness. The enclosure provides effective attenuation at better than 50 decibels over the frequency range of 1 MHz to 1 GHz. The testing for the SE-2 was done to MIL-STD-285 using NSA specification 65-6 methodology. The enclosure also includes a patent pending door and frame design where hook and loop seals are used. The unit is equipped with 115 CFM forced air ventilation through RF-protected vents. The unit is also field repairable, and the repair kit comes with the unit as part of the base package. The entire unit may be customized to customer specifications. BEMA also took the further precaution of making the enclosure's material fire retardant and they also weatherproofed the SE-2 so it could be used in the outdoors as well as within another structure. It is this last feature that makes the SE-2 a prime candidate for military communications functions. Thomas stated that there has been significant interest from the different intelligence agencies, and foreign governments. According to Thomas, the intelligence community within the U.S. government has begun using the SE-2 for electronic information security purposes, also, a large Japanese corporation has placed an order for a standard SE-2, meant for the Japanese Civil Defense Ministry. Based on some recent conversations and facsimiles, the Japanese government has expressed a keen interest in the SE-2 from an industrial as well as military viewpoint. As Thomas stated, the SE-2 has many applications. The company is starting to market the product for use in testing labs where engineers can isolate, calibrate and test several pieces of electronic gear. Thomas said the SE-2 is also useful for isolating electromagnetic interference between machines. Thomas states that the company has begun marketing to several U.S. government agencies for both standard and customized units. In fact, he stated that one of the next product iterations will be to make an even smaller unit to be integrated into an oversized briefcase that would expand into roughly the same dimensions as a phone booth. In this configuration, the SE-2 could be combined with STU-III encrypted phones and digital masking to provide total electronic and acoustic security for the travelling executive. "Imagine, if you would, going into a restaurant in Washington and being able to talk business over dinner while sitting in a Get Smart type of "cone of silence" where you could be totally sure of not being overheard, or checking into a hotel room anywhere in the world and having total electronic and acoustic security within minutes, all packed neatly in an oversized briefcase," says Thomas. That scenario could be feasible if the company is successful in their negotiations with another company that would allow BEMA to also include that company's sound dampening technology in the SE-2.